Last.ify from Spotify takes the music connected to your Last.fm profile and automatically generates Spotify playlists based on your listening habits. Quite a few other sites create playlists in this way, too, but it’s worth trying out a few to see which one you like best. 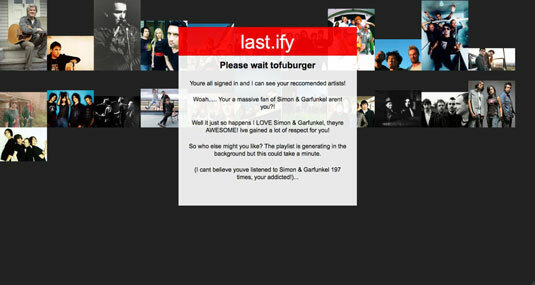 Go to Last.ify, enter your Last.fm username in the text box, and then click Make My Playlist. You get redirected to the Last.fm website and are prompted to enter your username and password, if you aren’t logged in already. Click Come on In to continue to your Last.fm account, if necessary. Click Yes, Allow Access to give Last.ify access to your listening data. You return to Last.ify, and it begins scanning your listening history. After the scanning process is finished (which takes a minute), click the big Spotify icon to go to your playlist. If the playlist appears empty, wait a few minutes for Spotify’s servers to sync your playlist. Now, watch and marvel while your recommended playlist appears. Apart from Last.ify, you can also try the Dutch-based site Spotrecord to get Spotify album recommendations based on your Last.fm account. Just enter your Last.fm username in the text box and click Get Recs — you don’t need to log into Last.fm. Suggested albums appear, along with cover art, on the results page, and you can click Gimme Some More if you aren’t happy with the initial suggestions. If loading cover art takes a while, deselect the With Covers (Might Be Slow) check box, which appears below the Last.fm Username text box. Music is something to share, and if one of your Last.fm mates is listening to music at the same time that you’re online, you can listen along with her via Spotify and share a moment, even if she’s on the other side of the world.